A maintenance passage. There will be some exciting action going on here. Testing the new color palette for the cave parts of Area 5, and a preliminary fog effect. Part of a flooded cave, outside the main part of Area 5. Most of my work was spent on the new water physics. I tried to fight an Alpha Metroid underwater, and even with HiJump and SpaceJump, it´s really frustrating. Just play Metroid: Confrontation, and try moving around under the lava, then imagine exploring half a sector of the game like that. So, instead of using direct speed multipliers for underwater, I had to make a separate set of speeds for all the states. This way, I could make the physics more like Super Metroid (it takes some time to build some speed, but you keep the momentum, and move fairly fast). This lead to a lot of tweking and bugfixing, but it´s working nicely right now. Work on the soundtrack will resume this week, once I have some decent material I´ll let you hear some of the new tracks. As always, comments and suggestions are welcome, here or in the forum. Amazing, cannot wait to see the finished area. Wow, I love the New Cave Area, its so cool! Woa, nice background. That mist is really cool. This just keeps looking better and better, good work! Solo pasava para decirte que espero que no te descuides del blog atendiendo el forum ok.
Hey, looks great so far. Mist is especially nice. I'd have to say, though, that the background of the cave doesn't quite fit. Not sure what it is, but it seems a bit off. Still looks good. Also, the water is a little too blue to match the darker cave around it. Perhaps just dim it a bit? Can't you please make it so you have the Gravity suit before you go there?! For crap's sake!!!!!!!!!!!!! Heh, I love the idea of moving through a water area without the gravity suit. I used to see how far I could get in SM w/o the gravity suit in the wrecked ship and maridia, or would turn it off in some areas to see what I could get away with. I like it because it gives a new level of challenge to deal with. i love your work man! I've been following this for a long time and honestly surprised your still posting regular updates and the game is almost done. I say this because most people who make projects as big as yours stop or are stopped by C&D orders. Keep up the good work! I was going to use Fish metroid in my game, I need a team. I need sprite artist, programmer, and musician. I have ideas for my game, but nobody to help me. Thanks for the update doc! I'm really interested in seeing how mist works out in the cave. It would be cool if moving mist would cover different parts of Samus up while she moves around. Also, thanks for atlest acknowledging that a lot of people suggest aquatic metroids. 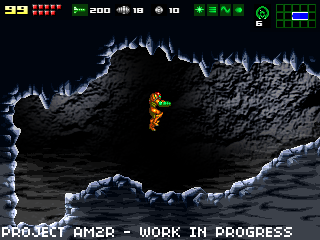 It will be something that would be a nice feature apsect implemented to have to fight alpha metroids (or even aquatic metroids) without the gravity suit and inhibited water physics. 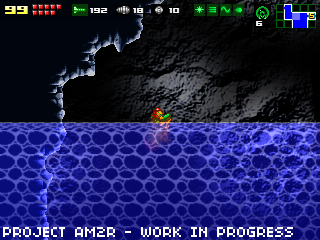 I can understand that fighting an aqua metroid in the water without gravity suit could be a bit difficult. 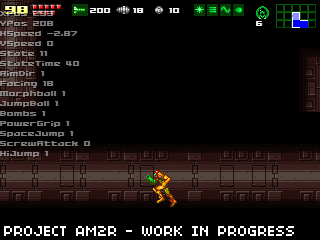 Although this might take a bit of coding, maybe you could alter the physics of the aqua metroid. The metroid could perform fast charge attacks underwater, but the rest of its movements would be hindred by the water, making it move slower. The metroid could pick up a little speed while moving underwater like Samus does in Super Metroid. As far as the pictures go, nice job. I have a couple comments. On the 1st, I realize that Samus is supposed to standing in a tunnel, but it doesn't really look like she is standing on anything. The ceiling and floor of the tunnel don't look clear enough. The second picture looks really amazing, and I like the fog effect. 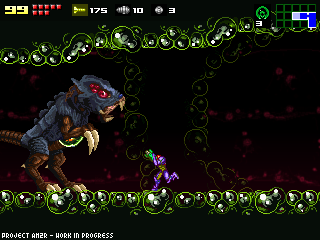 The place reminds me of lower crateria in the hack Super Metroid Redesign. I hope you make a lot of rooms like that. It would be fun to explore a maze-like area of empty caverns. The water on the 3rd picture doesn't look quite right. I think the light blue lines should be darker so they don't clash so much much with the rest of the water. Also, the water might look more fitting to the environment if you made it murkier. This would also help create a darker atmosphere in this area. I'm not exactly clear on what area of the game these caverns are in. Is this the area with the Omegas, or is it the brand new area you've mentioned before? Nice idea with the water physics. Will the water effect the speed of the metroid? Its hard to wait for this game. Really looking forward to playing too. In Nintendo-made installments, when the player is made to fight underwater opponents, the enemies have some sort of movements they go through that clues the player in on what it's about to do, allowing the player the necessary time to react. The Alpha Blog from Prime 2 is an excellent example of that. I agree that the water used in the caves doesn't really fit. If you made it a dark, almost black muddy brown, with a particle effect showing sandy residue in the water moving out of the way as you walk through it. THAT would be AWESOME. Surprisingly simply to make too, I would think. Why would cave water really be muddy/dark? Generally speaking, deep earth/spring/cave water is crystal clear. Lots of silt on the lake bed from erosion, but very clear. Sorry purplecow, I'm going to have to agree with karrde and anonymous. Muddy water with particles wouldn't be geographically correct and wouldn't be that interesting either. I would prefer the crystal clear water that appears darker because its an underground cave. I can't freakin' wait till this is done. You are amazing. I thank you immensily for putting so much of your time and effort into this professionally done piece of work. Amazing! Is it me? Or does the water semm a little too blue? Well obviously I don't know very much about cavernous ecosystems. But darker is better at least. Maybe save the particle effects for some other aqueous body...or something. Don't forget the 8bit version for those of us who have the urge to puke whenever they see the Zero Mission engine! Looks really good, but the opacity on the water definitely needs to be turned down. Make the water similar to the Super Metroid Redesign water, in every aspect. The background is perfect. I don't think any of the backgrounds Nintendo have done have been better. Whoa, when i saw some videos of the remake i was amazed, It's really good you're still working on this game! The water and stone bg aren't looking so hot though. Do you need a spriter for them? Thank you. SOOOO Much. This game looks epic which my epic means awsome x 2,000,000,000,000. I am sorry you had to spend so much time and effort on this game, but think about it this way, you will make somthing you will be remembered for for a very long time. and I theink I speak for everyone when I say, thank you, from the bottom of our hearts, thank you. I have played and beaten every single metroid game, no exaderation. I am happy that i know that other m will not be the last. Thank you. And i am not emo. ia am just thankful.